Although a crystal can be made, and Daniels provides his insights into how this can be done by hand methods in Watchmaking. Not feeling a strong desire to do this myself I searched about for one that would be suitable. I wanted a glass crystal, of course, and domed glass crystals of this size are no longer made, at least they are not readily stocked by the material supply houses. Antique crystals are occasionally available, and I found a small lot of these on eBay. They are labeled as VTF France, and are graduated in the ligne system. 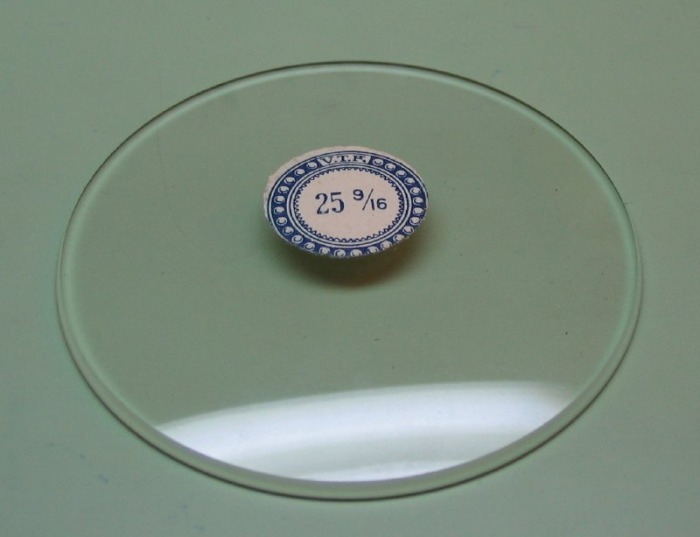 I suspect a crystal suitable for this size of watch will be in the 25 ligne size range (see chart below). For example, the one shown below is 25 & 9/16 ligne, which is 57.66mm. I had tried finding more information on the maker of these crystals but could not find much. Then I found in the December 2009 issue of the NAWCC Bulletin an article all about antique watch glass! VTF apparently stands for Verrerie de Trois Fontaines, a 19th century glass maker. The company still exists in some form, still making some form of glass for commercial applications. The type of crystal shown below was referred to as mi-concave, domed with a deep bezel.